Huobi used to be one of China’s most popular crypto exchanges, which sort of fell victim to the country’s industry-wide ban, back in October. Instead of closing up shop and fading into the sunset though, the operation simply moved its headquarters and its web address to the current Huobi.pro. These days, it is peddling its services as a truly global crypto operator, and it continues to add services, client perks and cryptocurrencies to its already impressive selection of more than 190 supported tokens. Long story short: Huobi.pro is firing on all cylinders again, and its exchange-focused services are not shabby at all either. According to Huobi.pro, the operation has set up several offices in Singapore, Japan and Hong Kong, and some of its operational departments are still active in mainland China. The site doesn’t really tell us who the people behind the operation are, instead focusing on the various features the exchange offers. What exactly does Huobi.pro offer though? The exchange supports more than 190 crypto pairs, broken up into three main markets: USDT, BTC and ETH. While of these, the USDT one is the most shallow in terms of supported currency pairs, it is in fact much more generous than what the competition has to offer in this regard. It currently features BTC, ETH, LTC, Dash, BCH, ZEC, OMG, XRP and EOS, among others. Indeed, new digital assets are added all the time. The last two on the New Assets list are HSR and QTUM. The BTC market is by far the most vibrant, with the most supported pairs, and the most newly added ones. In addition to these two categories, the market also features currencies added as a result of forks, like BTG, BIFI and BCX. The ETH market, which lists OMG and EOS as its main currencies, is also very happening. To move all these assets around, traders are offered a rather superb web-based trading platform, which is very powerful in every regard. Its charting features are superb. A variety of time frames are supported, charts can be customized and there are a surprisingly large number of technical indicators available, indeed at least as many as in MT4’s pre-installed indicator package, which is quite a feat. 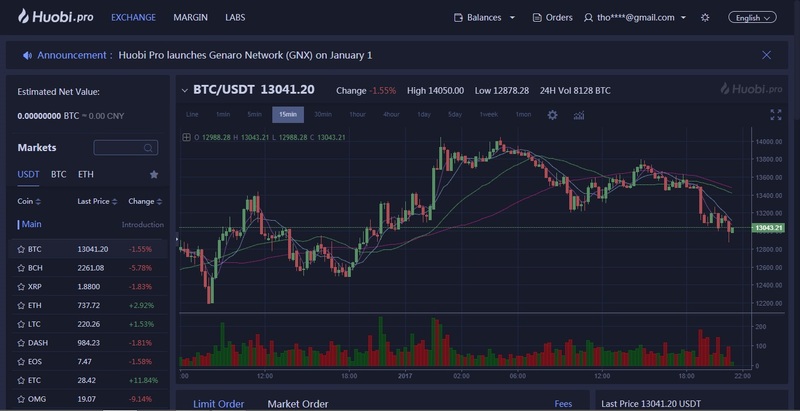 Market orders and limit orders can be placed and the platform provides detailed information on one’s open orders, order history, as well as the depth of the market. The market trades are displayed in real time too, offering a more than relevant picture of the overall market sentiment concerning the analyzed asset. Holding over $1 billion in assets, Huobi is available in more than 130 countries. Margin trading is available as well. To take advantage of this feature – which essentially amounts to a lending service – traders are required to “sign” a special agreement though. Margin accounts come with more risks, so caution has to be advised in this regard. Huobi Labs is perhaps the most interesting feature of the operation. It is essentially a blockchain incubator, dealing with pre-ICO projects, assessing their viability, offering advice and guidance, and eventually giving startups the possibility to introduce their digital assets through Huobi. The services offered by Huobi Labs cover ICO advice, trading advice, professional service, liquidity and token economics. The Huobi SMARTChain Blockchain Asset Assessment Model is also used in determining the viability of a newly created digital asset-class. This model is explained in detail, through a whitepaper-like description, directly on the Huobi.pro website. Safety, security and stability are some of the core values of the operation. Some 98% of the funds used at the exchange are kept in cold storage, the operation is DDoS-protected and it can show 4 years worth of stable infrastructure operations to back up its case. Pesky verification procedures (like the provision of personal ID-scans) are part and parcel of the Huobi.pro package too, there’s no way around that. The operation does indeed look like a well-established and serious exchange, and launching platform for new blockchain projects. It is indeed global in scope, and there’s little to no negative user feedback available on it out there. It does indeed look like Huobi continues to be the real deal. While we don’t really have any genuine red flags to point to in this instance, the fact that the people/corporate entities behind the operation are seemingly secretive regarding their identities, is not exactly trust-inspiring. 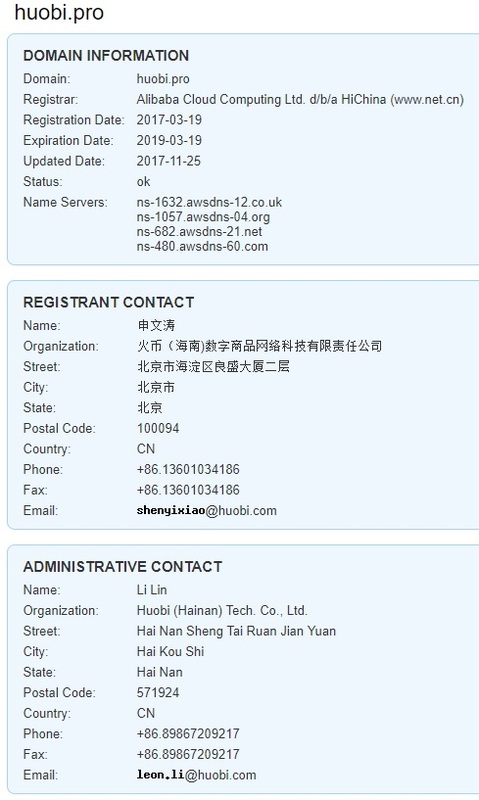 A quick Whois query on the Huobi.pro domain name will reveal though that the registrant organization behind the site is Fire Coin Hainan Digital Products Network Technology Ltd, and the name of the registrant is Shen Wentao. The address of the registrant is Haidian District, Beijing Liang Sheng Building, second floor, Beijing City. Do not let the recent date of registration confuse you though: Huobi was forced to move to this new web address recently, to escape China’s ban on crypto exchanges. It is really surprising that there are almost no complaints posted in regards to any of the services peddled by Huobi.pro. Despite the fact that the operation looks legit, this seems quite unnatural. Huobi may have taken a hit following China’s crypto exchange ban, but they are definitely still rocking and rolling. There’s no shortage of new perks and features at the operation either. The exchange recently held an Essay Contest focused on Dash, and it has just rolled out (on January 1, 2018) its Genaro network, a Turing-complete public chain, which is hailed by many as the first step towards the blockchain 3.0 ecosystem. Genaro’s main features are a decentralized storage network and increased processing speeds of tens of thousands of transactions per second. Through this network, developers can store their DAPP data and they can develop smart contracts. With trading fees set squarely to 0.2%, Huobi is an attractive destination in this regard as well. The powerful trading platform, combined with the overwhelmingly positive user feedback makes this exchange one to keep an eye on. In addition to all the above, Huobi have considered the introduction of peer-to-peer trading in fiat currencies, that would allow Chinese citizens to keep purchasing cryptos for Yuan, thus essentially defeating the government’s ban on the vertical. What’s your opinion on Huobi.pro? Share it with us by commenting below this review! The people behind Huobi are thieves. One day, they simply blocked my account because they said that it presents “security risks”. They have never been able to explain me what is going on. Don’t put your coin at Huobi!